David Reid for CNBC: Almost 4 in 10 U.S. jobs are at risk from being taken over by robots, according to the latest report from consultancy firm PwC. The analysis released Friday suggested that 38 percent of U.S. jobs could be at high risk of automation by the early 2030s, higher than the U.K. (30 percent), Germany (35 percent) and Japan (21 percent). The 15-year timeline does not appear to be shared by the U.S. Department of the Treasury, however. 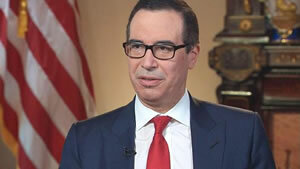 In comments made to Axios Media on Friday, U.S. Treasury Secretary Steven Mnuchin said he was not worried about the mass displacement of U.S. workers by robots and could be a century before a labor crisis eventuates. "It's not even on our radar screen ... 50-100 more years," Mnuchin said. He added that he was "not worried at all" about robots displacing humans in the near future.